LOCATION.--Lat 39`58'07", long 75`40'25", Chester County, Hydrologic Unit 02040205, on left bank at downstream side of Sugars Bridge (U.S. Highway 322), 2,000 ft upstream from Valley Creek, 1.5 mi north of Marshallton, and 3.3 mi southeast of Downingtown. PERIOD OF RECORD.--February 1972 to current year. GAGE.--Water-stage recorder, crest-stage gage, and Pluvio precipitation gage. Datum of gage is 195 ft above National Geodetic Vertical Datum of 1929, from topographic map. Feb 1 to Apr 10, and Jun 25 to Nov 17, 1972, non-recording gage at same site and datum. Satellite and landline telemetry at station. COOPERATION.--Station established and maintained by the U.S. Geological Survey. 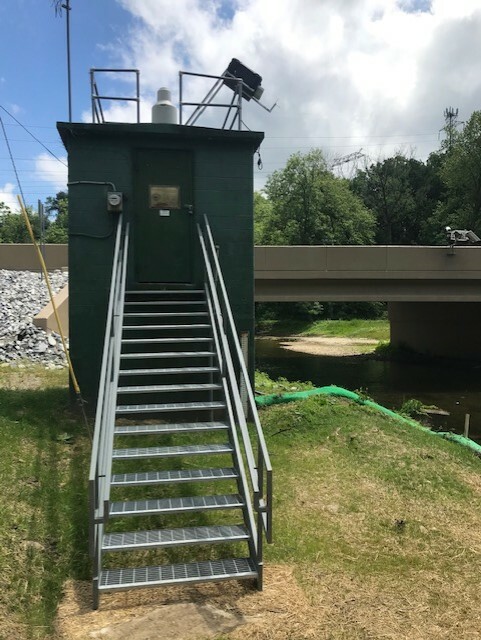 Funding for the operation of this station is provided by Chester County Water Resources Authority and the U.S. Geological Survey. REMARKS.--Flow regulated since November 1973 by Marsh Creek Reservoir (station 01480684), about 7.5 mi upstream. Water-quality data collection discontinued during winter months since the 1981 water year. Other interruptions in the record were due to malfunctions of the equipment. NOTE: REAL-TIME CONTINUOUS WATER-QUALITY DATA HAS BEEN TEMPORARILY SUSPENDED DUE TO BRIDGE CONSTRUCTION. DATA CONTINUE TO BE STORED AND WILL BE UPDATED ABOUT EVERY THREE WEEKS.